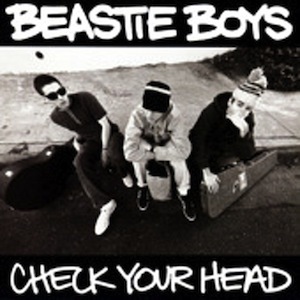 So I was browsing through the cheap bin at Reckless Records a couple of weekends ago, when I came across not one, but two copies of Beastie Boys’ 1996 album, Check Your Head. I can’t turn down a two-dollar record of white dudes rapping, so I snagged a copy and checked it out. I learned something tonight. Beastie Boys records should not be listened to in full. Well, Check Your Head shouldn’t, at least. These guys are good in small chunks. Hell, I can even handle a couple of their songs back to back, but when you put twenty of them in a row and feed them through my headphones, we’re going to have a bit of a problem. Beastie Boys have always been gimmicky. Most of their songs sound the same—they’re all pretty catchy, some of them are fairly funny, but they’re all pretty low on creativity. But, would I go to a Beastie Boys concert? Absolutely. You definitely don’t have to know all of their songs by heart to enjoy yourself in a situation like that. Plus, this record has the problem that oh-so-many hip-hop albums have. It’s not just that there are way too many songs, it’s that there are way too many pointless instrumental tracks. Let’s be real here, this is the Beastie Boys, no one is looking to zone out to a chill beat when they pop this record in. It’s not like the guys had to stretch out the album to compensate for a lack of material; this album is more than 50 minutes long. Overall, this has been a rather disappointing experience. ← Day 300: Insane Clown Posse – Bang! Pow! Boom!